As the 40th President of the Southern Association for Vascular Surgery, it is both a pleasure and an honor to serve the society. The SAVS is thriving. It is vigorous, it is robust. We have a rock solid foundation that has lasted over 40 years and I am certain it will last for a significantly longer period of time in the future. The society is driven by the dynamic energy of our Association and our membership. 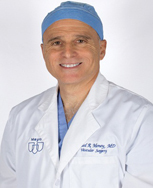 This drive, energy and expertise in vascular surgery stands among the best in our specialty. The 2016 Annual Meeting in Cancun, Mexico was truly a successful meeting. The accommodations at the Ritz Hotel were a perfect backdrop for the absolutely spectacular scientific presentations and the great social agenda. Local Arrangements Chairman, Russ Samson along with April and her team from PRRI were responsible for orchestrating a truly terrific social program. I must admit, the fact that there was even a conga line going at the banquet is one memory that I will never forget. Past President Scott Stevens and his lovely wife, Laurie, are truly to be thanked for making an unforgettable meeting. The scientific part of the meeting was unmatched. Program Committee Chair, Scott Berceli and the full Program Committee deserve tremendous thanks for putting together a great Scientific Program. Congratulations must also be shared with the Post-Graduate Course organizers. This year’s course on Wound Healing was very helpful to many of our members and shows how vascular surgery is evolving from not just vascular surgery but being true vascular experts in vascular, endovascular and in the total care of the patients. The Mock Oral Exams were fully utilized and I am certain that all of the fellows who participated gained tremendous knowledge. Thanks to Rick Endean for serving as Secretary/Treasurer over the past five years. Rick did an absolutely spectacular job coordinating the meetings. I am personally happy that he is now our president-elect. Thanks must also be extended to Matt Edwards. Matt has served as Recorder for the last five years and served as Director of the Mock Oral Examination sessions. Both of these gentlemen deserve tremendous appreciation of the Society. Dr. Peter Lawrence, Past President of the Society of Vascular Surgery, served as the Jesse E. Thompson Distinguished Guest Lecturer. He spoke to us about “Low Frequency Vascular Disease: Are they more Common than we Thought?” He also shared with us the consortium that he has put together in an effort to add some science to the ever evolving problem of low frequency vascular disease. I would like to thank Dr. Lawrence, again for his attending the meeting and his constant contribution to our specialty of vascular surgery. The Southern Association for Vascular Surgery has always had a special place in my heart. It was one of the first Vascular Meetings that I attended as a fellow. I appreciate the Southern Vascular because it serves twofold. It serves to educate me and it also serves to entertain me. The scientific portions of the Southern Meeting are exemplary. The highest rate of acceptance from any regional society to our journal, the Journal of Vascular Surgery, is led by the Southern Association for Vascular Surgery. In addition to that, the collegiality of the meeting is unmatched. People from all over the country speak of the Southern as a perfect meeting. It is that perfect blend of both great science and great social partnership of vascular surgeons in the fraternity of our specialty. I ask you to mark your calendars for the 2017 SAVS Annual Meeting. The meeting will be held at the Naples Grande Resort in Naples, Florida. The meeting will be held from January 18-21, 2017. I would hope that we can have a tremendous turnout just as we had in previous meetings.